Historical Marker #2283 in Shelby County commemorates the massacre of members of the 5th United States Colored Cavalry (USCC) near Simpsonville. On January 25, 1865, Company E of the 5th USCC was transporting a herd of 900 cattle to Louisville. These troops, based at Camp Nelson in Jessamine County, had previously fought at the Battle of Saltville, Virginia. Nearly all of the soldiers were former slaves. When the troopers neared Simpsonville, they were attacked by Confederate guerrillas. During the fight, which the Louisville Journal called "a horrible butchery," twenty-two of the USCC were killed and eight were severely wounded. At least four of the injured later died from their wounds. Local resident Julia Tevis called the ambush "one of the bloodiest tragedies." She added, "never did I expect to see such a state of things in my own, dearly loved country." Simpsonville USCC Memorial: On January 25, 1865, Company E of the 5th United States Colored Cavalry (USCC) were attacked by pro-Confederate guerrillas near Simpsonville. 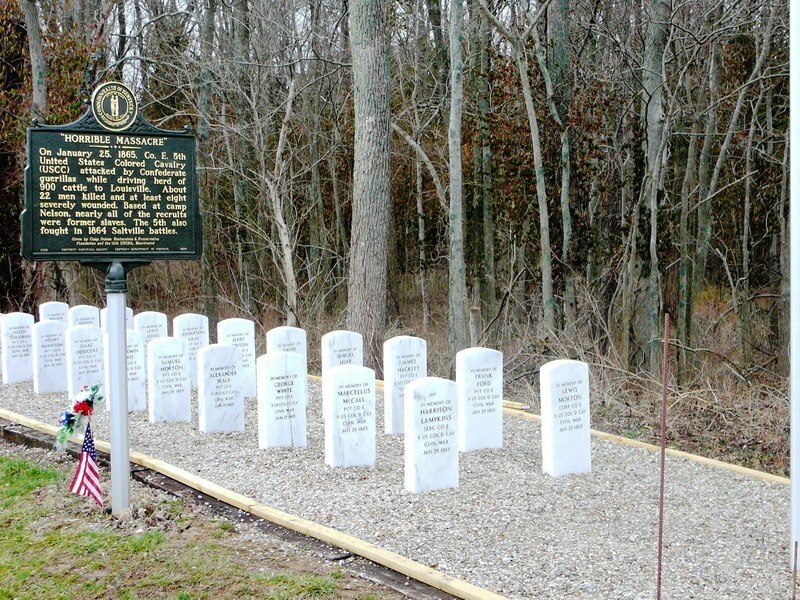 There are no burials at the memorial; instead, the USCC casualties were buried in a mass grave near this site and were commemorated with this memorial by the Shelby County Historical Society. Photo courtesy Jerry T. Miller. Simpsonville USCC Memorial Site: On January 25, 1865, Company E of the 5th United States Colored Cavalry (USCC) were attacked by pro-Confederate guerrillas near Simpsonville. 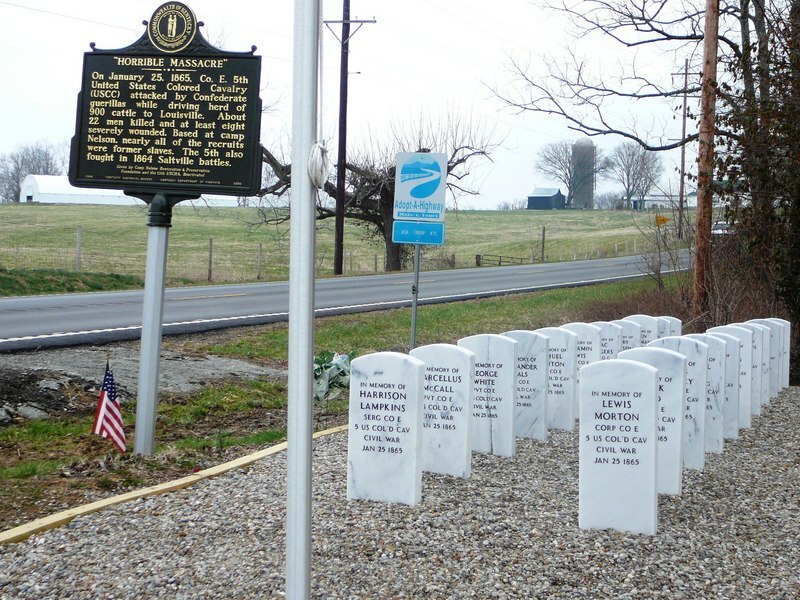 There are no burials at the memorial; instead, the USCC casualties were buried in a mass grave near this site and were commemorated with this memorial by the Shelby County Historical Society. Photo courtesy Jerry T. Miller. Sanders, “Simpsonville Massacre,” ExploreKYHistory, accessed April 22, 2019, https://explorekyhistory.ky.gov/items/show/35.